In this blog post, I'm going to describe an exciting book launch that took place on March 30 this year at my favorite haunt in Delhi, Costa Coffee South Extension II. It was the much-awaited launch of Nikita Singh's latest novel 'Like a Love Song'. Even though I haven't read any of her bestsellers to date, I've heard so much about her work (especially with reference to 'After All This Time' and 'The Promise') that I just had to be there*. 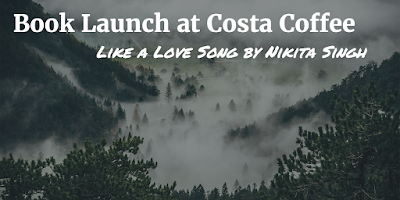 Having penned eight novels before 'Like a Love Song', Nikita seems to be on a roll at the moment! This is perhaps for the first time that she has collaborated with HarperCollins India and Costa Coffee* for the launch of her new novel. The launch was presided by Mr. Ashish Chanana, COO Costa Coffee and Ms. V.K. Karthika, Publisher, HarperCollins India. Before handing over the mike to Nikita, Ashish spoke passionately for a few minutes about the beginning of a long-term association between Costa Coffee and HarperCollins India in the form of Books 'n' Bean initiative. The intent is pretty clear - to bring both coffee and book lovers together! Starting February 14, 2016, all Costa Coffee outlets across the country will serve as venues to promote book reading and launches. If you're a fan or a follower of your favorite authors, you can come to Costa Coffee, attend their book launches, and even get a chance to interact with them during the 'Author Meet n' Greet Sessions'. I do believe that books and coffee share a timeless connection with each other; a wonderful selection of books and coffee can never go wrong! If you're a patron of Costa Coffee, there is another good news in store for you! Discover a dedicated book space for coffee lovers at all their outlets, wherein you can browse through a range of titles from HarperCollins India. The idea of a 'Book Club' at cafe is indeed a great one, and must be actively pursued. She is more of a 'realist' than a 'romanticist'. Her favorite authors include Jhumpa Lahiri, an award-winning Indian American author, better known for her first novel, The Namesake. Her preferred genre is romance, so she chooses to write about it, more specifically in context of 'romance with a man'. Since Nikita is still in her final semester of Masters, she enjoys reading a lot. She also feels that writing with a bunch of writers is a different experience altogether. Her advice for budding writers is to first master how to read. According to Nikita, "If you read better, you write better! Prose gets richer when you read something that's good." Nikita feels that writing has changed her level of patience: "Am a little less impatient now!" she says. As I writer myself, I couldn't agree more! If Nikita had it her way, she would go back in time and edit all her books. Her latest novel 'Like a Love Song' showcases the personal and professional stories of two females - Mahi and Laila. Her next book is going to be exclusively about Laila. Baking is a central idea of her new novel*. All her books center on female characters; these characters are very real, and as Nikita says, flawed without being bad people. Her advice for females: "Females all across the world first need to be in love with themselves before they can go ahead to love others." And finally, on the topic of how to get published, Nikita responded by saying, "Concentrate on writing and rewriting. Write 1 to 2 chapters in one go. Also, plan your book at least 8 to 10 months in advance." These golden words from Nikita will inspire zillions to achieve their dreams of becoming an author someday.